The leaves outside are starting to change colours, which means that the holiday season is almost here. Are you ready for a full schedule, gathering around dinner tables with friends and family for Thanksgiving, New Years, and all the holidays in between? Being a craft winemaker comes in handy this time of year. It's a DIY hobby that lets you tailor-make a palette-bursting varietal that pleases everyone on your holiday list. Even better, a craft winemaking experience makes for a great gift. And with RJS Craft Winemaking offering countless flavour options to master, there should be plenty to toast this holiday. Here are just a few reasons to give the gift of craft wine — whether it's a bottle of your own making or a gifted experience for your friends. If you're scratching your head trying to find something for the person in your life that wants for nothing, a winemaking experience is a tasty and thoughtful alternative to the norm. If you're already an independent bottler, why not offer up some of your personal stock to show them how simple and sippable a personally crafted Syrah or Pinot can be? Package this with an experience that lets them explore the world of winemaking on their own. Bonus, there's a good chance your fellow winemaker will let you savour one of their latest creations somewhere down the line. There's nothing better than receiving a thoughtfully curated gift from someone you love. And if you've got a flair for DIY, winemaking will be a rewarding experience for you and your dearest. Winemaking offers you the chance to curate a variety of yeasts, oaks, fruits and concentrates into your product, it just depends on who you're bottling for — your mother might like a crisp Riesling, while your bestie prefers a bold-bodied Cab. With endless palette-pleasing options, you can prep personalized bottles for your whole crew. Most varietals will take between 4-8 weeks, leaving plenty of time to create a colourful, customized label too. Just don't be surprised when your friends return their bottles for a refill! DIY doesn't mean you have to go it alone; a winemaking experience makes for an awesome gift, and group project! With friends, partners or family, if you've enjoyed a bottle (or two) together in the past, you'll likely have each other's palettes down pat. Whether you're putting a personal twist on a favourite blend or looking for a bold new adventure, getting hands-on together — from selecting ingredients, to the fermentation and bottling stages — will make the experience all the sweeter. Even better, when it's all said and done you can pop open your crisp collab and enjoy the fruits of your labour together. Cheers to that! 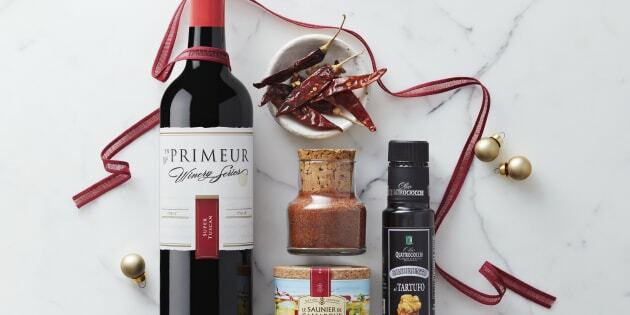 Give the perfect gift this holiday season: From bright whites to rich reds, it's easy and fun to create your own delicious blends with RJS Craft Winemaking kits.